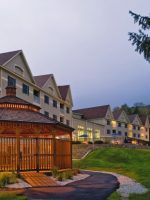 The Country Inn at Jiminy Peak is located at Jiminy Peak Ski Resort in the Berkshires. Each suite has a separate bedroom with a king bed and a living room with a queen sleeper sofa, along with a fully equipped kitchenette. 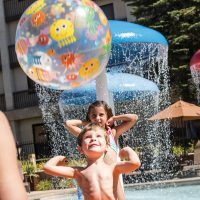 Families also enjoy an outdoor pool, both indoor and outdoor whirlpools and complimentary Wi-Fi. Great weekend with family and friends, with great accommodations in Country Inn. Food experiences in Christensen's Tavern and John Harvard's Restaurant were excellent. Also enjoyed pool and hot tub. Conditions could not have been more perfect as it was snowing when we arrived, and continued thru the night. Trails were expertly groomed and we had a wonderful time! We had a wonderful weekend! Our 5 and 6 year old had never skied before and they loved the KidsRule all day program. The entire KidsRule staff is so helpful! The rest of us enjoyed the skiing and lodge while they were there. We can’t wait to go back!